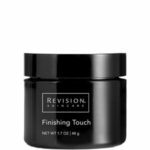 Finishing Touch is a microdermabrasion scrub for polished skin. Contains Freshwater Silt that hydrates, nourishes and helps absorb impurities. Leaves a moist, clean feel after rinse-off unlike most scrubs.